North-Holland Series in Applied Mathematics and Mechanics, Volume 25: Three-Dimensional Problems of the Mathematical Theory of Elasticity and Thermoelasticity focuses on the theory of three-dimensional problems, including oscillation theory, boundary value problems, and integral equations. The publication first tackles basic concepts and axiomatization and basic singular solutions. Discussions focus on fundamental solutions of thermoelasticity, fundamental solutions of the couple-stress theory, strain energy and Hooke’s law in the couple-stress theory, and basic equations in terms of stress components. The manuscript then examines uniqueness theorems and singular integrals and integral equations. The book ponders on the potential theory and boundary value problems of elastic equilibrium and steady elastic oscillations. Topics include basic theorems of the oscillation theory, existence of solutions of boundary value problems, integral equations of the boundary value problems, and boundary properties of potential-type integrals. The publication also reviews mixed dynamic problems, couple-stress elasticity, and boundary value problems for media bounded by several surfaces. 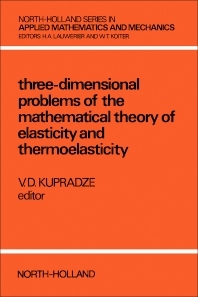 The text is a dependable source of data for mathematicians and readers interested in three-dimensional problems of the mathematical theory of elasticity and thermoelasticity.